It’s well established that Chicago is a city that loves to eat and we have big, Midwestern-powered appetites. Naturally, our favorite dishes match our appetites with towering, heart-disease-defying portions.This is not only the town that created deep dish pizza but also Italian beef sandwiches and Chicago-style hot dogs. Each is a reflection of the special Chi-town taste sensibilities and requires at least an introductory bite into Chicago food history. From skyscrapers to electric blues riffs, Chicago style is synonymous with big and that certainly describes our signature pizza. When people hear deep dish they think thick crust but that’s not really what defines authentic Chicago style pizza. This is pizza that must be baked in a pan and arrives at your table rising 3-4 inches from the pan. The top layer is made from a thick helping of tomato sauce, not cheese and the toppings are actually buried under the cheese and sauce. And your typical, pitiful slices of thin crust pizza that you eat with your hands, Chicago style pizza can’t be contained that way and requires a knife and fork to catch every gooey morsel. The first pizza parlors credited with inventing the deep dish style is Pizzeria Uno and its spinoff, Due. 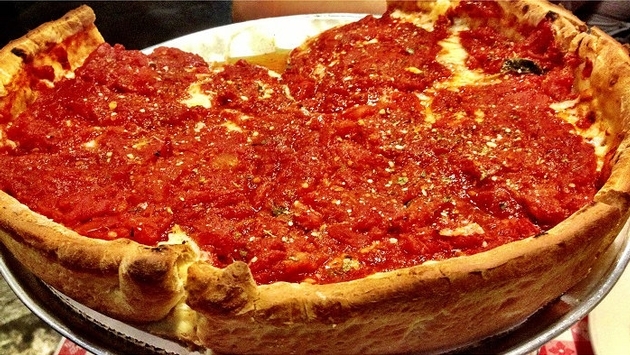 Go here for the original deep dish pizza, in an old school mansion in the Gold Coast neighborhood. Contemporary faves include Lou Malnati’s, Pizzeria and Giordano’s. About a decade before Chicagoans could sink their teeth into deep dish pizza, they were enjoying the juicy delights of Italian beef sandwiches. People outside the midwest are often confused about what this is. It wasn’t until I was an adult that I realized that the rest of the world didn’t regularly eat mounds of beef between Italian bread rolls. Italian beef is seasoned and thinly sliced, dripping in juices. The Italian roll is crusty on the outside and soft on the inside. You can order it hot with giardiniera peppers or sweet with sweet peppers but it’s the juice that really defines an Italian beef sandwich. An Italian beef sandwich is always moist but you can request that it be dipped which will cause the bread to get soggy, juicy which will leave your hands covered in gravy or soaked, where the whole thing disintegrates and you have to mop it up with your fingers. This is not dainty eating. The Little Italy landmark, Al’s Beef is said to be where the sandwich was invented in the 30s and it remains the place for the best version. Joe Boston’s Italian Beef and Portillo’s serve up close seconds. You may think you know what a hot dog tastes like but frankly, if you’ve never bitten into the hearty flavor of a Chicago dog, you really don't have any idea. A Chicago dog is made from all beef, no fillers, couched in a fluffy poppy seed bun, The toppings are yellow mustard, relish, tomato wedges, chopped onions, a pickle spear, hot peppers and celery salt. You’ll thank me later. Savor the perfect Chicago dogs at Portillo’s and The Weiner Circle.